STUDEBAKER Authorized Dealer Sticker - $10.00 : Bob Hoyts Classic Inspection Stickers, Add a Final Touch to your Restoration! 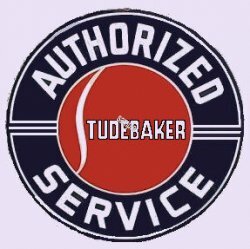 This attractive Classic sticker identifies Studebaker Authorized Sales and Service owners from the 1950's and 1960's. It typifies the long gone Studebaker dealers but keeps alive the Studebaker name. It is approximately 2 1/2 inches square.